We went over how to use Google to search for Rapidshare files in a previous post, but it certainly wasn't the final word on the subject. Our previous method searched for webpages on the Rapidshare.com domain that contained our search terms, but the method we will discuss now involves searching for external webpages that contain links to files hosted by Rapidshare. One disadvantage of this method is that outdated links may be more likely to pop up in search results. Along with our new method, we have a new tool; a reader recommended ShareMiner as the search engine of choice for what we are about to do. It dramatically simplifies the process of conducting searches by offloading the tedious task of typing in code to the ShareMiner search engine. ShareMiner not only supports searching for files on Rapidshare, but also those residing on the servers of Megaupload, SendSpace, Badongo, Megashares, and 7 other services. How does it work? Once you get to ShareMiner, simply type in the name of the movie, software, video, music, or other file that you're looking for, check the services you want to search, and ShareMiner does the rest. Search results will open in a frame below the search pane. 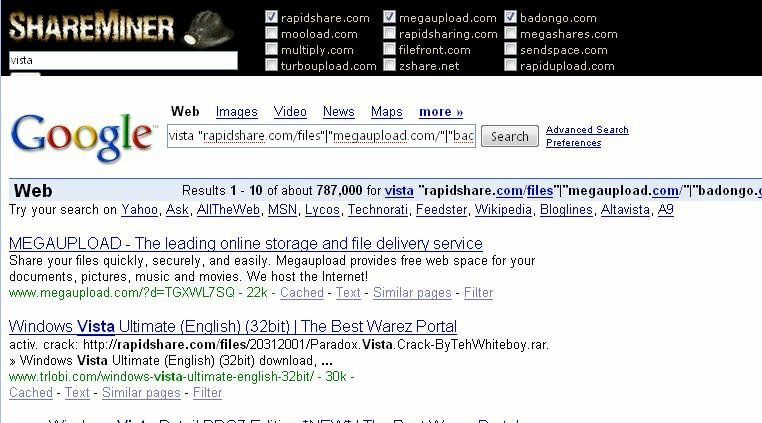 We conducted a search for pages that contained the word "Vista" on pages that linked to download pages on Rapidshare and Megaupload. This returned almost 800,000 results. Pretty impressive. 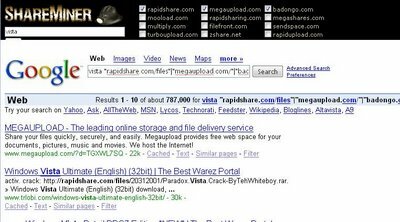 You can see in the screenshot below that the search syntax is, in plain language, search term "Rapidshare link"|"Megaupload link". | stands for "or". Obviously, you could duplicate this search manually, but why bother when ShareMiner does the work for you? Your next step could then be to plug in the URL to a download manager like USDownloader for speedy leeching. just founded megaupload search tool. maybe it'll be useful for you. guys wants to earn a rapidshare account legally and in very fast way? When asked for credit card details simply say cancel. You do not need to fill it. premium account of 1 year in IN NO TIME. 4. Another thing you can also use paypal money to buy stuff on ebay and other shopping sites. 5. Thats is it. So Simple and I swear it works. BEST WAY TO LEGALLLY OWN A RAPIDSHARE 1 year PREMIUM ACCOUNT. Join this site. It is also free. You get paid for completing surveys over there 6$ to 4$ dollars per survey and 1.25$ per referral thats a lot of cash . DON,T WAST UR TIME NO ONE WILL GIVE U ACCOUNT I WAS ALSO TRYING THAT FROM LAST 1YEAR BUT I GET NOTHING BUT NOW I HAVE MY OWN RAPIDSHARE PREMIUM ACCOUNT. offer valid till 30 days!! LEGALLLY OWN A RAPIDSHARE 1 year PREMIUM ACCOUNT. 6 It is 100% safe and this method will give u money in not more then 30 minutes!!!!!!!! When asked for crediy card details simply say cancel. You do not need to fill it. hi! ever since beggining of this year, i've been trying my level best to have a rapidshare premium a/c and pass, but all that i get are not working.. please make my year and be my hero by sharing with me at therosdu@yahoo.co.uk , and be ready for the reward.. cheers!.. EARN LEGALLLY OWN A RAPIDSHARE 1 year PREMIUM ACCOUNT. Google Phone? End of 2007?